"Taylor also layers nearly every poem here with intimations of temperature or scent, environment or sound, weaving a sensory experience beneath the narrative lines and contextual elements of each text. So this too, like the curious breaks in phrasing, keeps us awake within this lulling exploration of life and death, this calm and impressionistic painting of how it is that we continue." "This brief collection is a model of how to be distinctive by being quiet and unobtrusive. Sadness permeates these poems, their understatement, skilfully handled, establishing mood and tone. ... It's good to read poems crafted with structured stanzas, as most of these are, to read poems that are alert to rhythm, that are powerful in their restraint." "Transition forms the sound of life, its sonal movement sustaining the sensory element best captured in Taylor's calmly startling prose." "Surprise hinges on each line-break of Taylor’s new poems, a precipice for the eye, and for the meaning that follows in the reading. Placed amid a familiar world of things and placesplace-names at leastwe face the irruptions of memory and death, and what is more searing as poetry, the memories of death. Taylor’s precision marks finality and descent into self-evidence." "This is a pliable and gentle collection, reflective and poignant in places but always revealing a sense of the wonder of life which is alive and well and living in Taylor’s perceptive brain behind that poet’s eye, so keen for detail." And the Weary Are at Rest focuses on one of life’s major considerationsmortality. 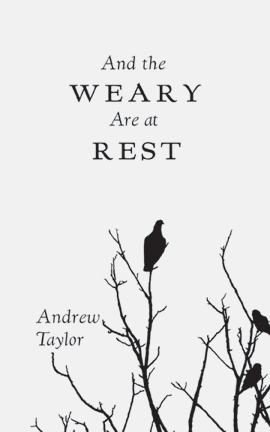 Examining the cycle of life, its regeneration, and its ends with a mature voice, Andrew Taylor’s poems invite the reader to experience, embrace, and celebrate the importance of existence while exploring the role of place and memory, with the author’s native Liverpool never too distant. Poems and an interview in Gloom Cupboard.